The perfect Christmas morning breakfast casserole. Festive, full of holiday flavor and easy to whip up! 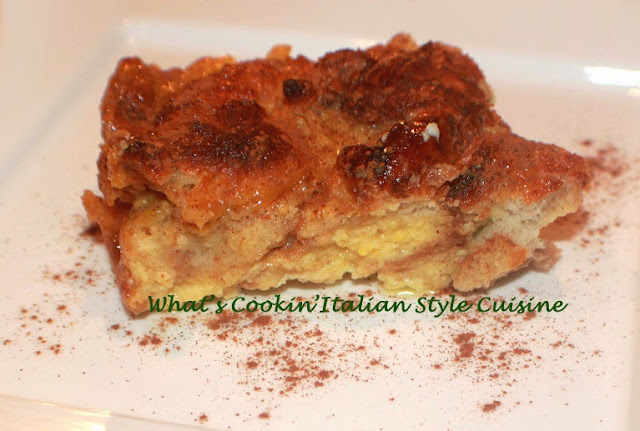 Eggnog bread pudding can be the best start of your day! In a medium size bowl, beat the eggs, vanilla, add the eggnog, cinnamon and nutmeg blend all together. In a casserole dish, place melted butter in bottom of the baking dish. Add the bread cubes. Pour the eggnog mixture over the bread and stir. Sprinkle the top with sugar and more cinnamon. Bake on 400 degree hot oven until the top is browned and pudding is cooked, around 40 minutes. Serve with whipped cream or a dusting of powdered sugar.